DUNGANNON and District 50+ Club commences its new season on Thursday 6 September in Dungannon Leisure Centre and welcomes new members. The aim of the Club is, in the interests of social welfare, to provide facilities for education, recreation and promotion of leisure time occupation. Anyone in Dungannon and District over the age of 50 is welcome to join the 50+ Club for a very modest annual subscription payable in September. This annual subscription entitles members to special rates at certain times in Dungannon Leisure Centre and to take part in trips, outings and talks arranged from time to time by the annually elected committee of the 50+ Club. Tuesday and Thursday mornings are the regular days for 50+ Club members when badminton, table tennis, soft tennis, bowls and swimming are available as well as exercises classes. For that well-earned break tea, coffee and biscuits are on hand up to 12.00 noon. Over the summer members met in Dungannon Park and enjoyed learning how to Nordic Walk. Fitness and Exercise Classes commence on Thursday 6 September and are held from 10.00 am to 11.00 am. 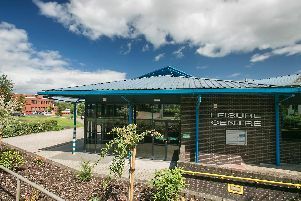 Aquafit classes commence in the Learner Pool on Monday 10 September from 12.30 pm to 1.15 pm. Tuesday Fitness and Exercise classes commence on the 11 September from 9.30 am to 10.30 am. . An evening at the theatre has been planned on 10 October to see Oklahoma in the Grand Opera House Belfast. Scottish Country Dancing classes commence in October. New members are always welcome so those who have celebrated that significant birthday and want to exercise in a social environment are encouraged to visit Dungannon Leisure Centre and join the 50+ Club.